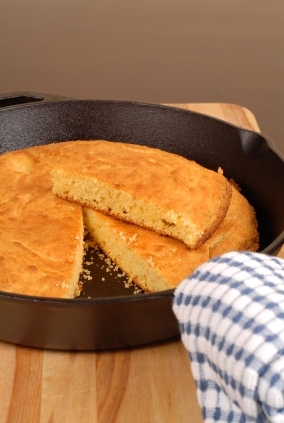 Learn how to make corn bread from scratch with a perfect tender crust. It's the best. If you've ever lived in the South, (or if you've spent time chatting with a Southerner), you probably know how particular they are about their biscuits and cornbread. I really enjoy this recipe and hope you do to. Melt the butter in a saucepan and add the sugar. Whisk in the eggs and mix until combined. Mix the buttermilk with the baking soda and add to the pan with the drained corn. Fold in the dry ingredients. Mix until JUST COMBINED. Please do not over-stir this batter. Pull the cast iron pan out on the rack and pour the batter into the hot pan. *Place 1 tablespoon of lemon juice or vinegar in a 1 cup measuring container. Fill the remainder with milk. Let sit for 15 minutes, and it's ready to be used in the recipe.